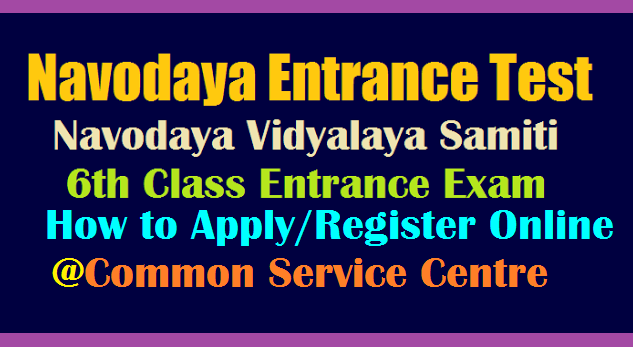 JNVST 2019 Online Registration Process | Navodaya Vidyalaya Samithi introduced Online System to Apply for Navodaya Vidyalaya Samithi 6th Class Entrance Exam 2019 onwards | Inntended students have to Register Online to attempt Navodaya Entrance Test 2019 | While Applying Online Students have have to Produce a Certificate from Headmaster of concern School where the student studying for the last 3years. Students have to visit Common Service Centre to Register/ Apply Online to upload Online Application Form. The eligible candidates along with his /her parent/guardians may approach Common Service Centre along with duly filled in certificate from the Head Master of School where the candidate is studying in Class V.
The format of certificate may be downloaded here under The sample of format is enclosed. The application for JNV Selection Test 2019 is being processed through Common Service Centre of Ministry of IT, Govt. of India. Common Service Centre has a wider range with 2.6 lac centres across the country virtually covering every village. As per the MOU with NVS, Common Service Centre will be charging Rs 35/­(Rupees thirty five only) towards service charge to upload the application form per candidate.